1. It takes me about 5 days to eat 4 pounds (POUNDS) of M&Ms. That's a record or something. 2. Ground Turkey and my stomach are not, nor will they ever be, best friends or even pleasant acquaintances. 3. Chuck loves Celine Dion (okay, so I've known that for years, but it's just so freaking ridiculous, it gets me every time). 4. In a foreclosure situation, people will just leave. With or without their junk. It's #4 that will be the focus for this post, in case you needed some sort of thesis statement (we'll revisit #3 at a later date, no worries). Some people lose their house (I know terrible, tragedy, whatever. Like Chuck and I would live here otherwise), and what they go through is beyond me. What I know they DON'T go through, quite often, is their junk. They leave that to us. In moving to The House, Chuck and I acquired a ridiculous amount of items. 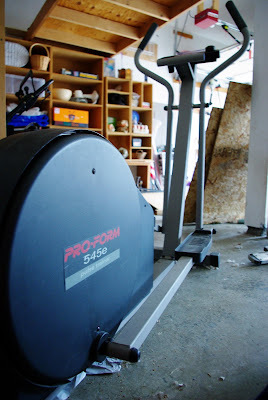 Here's the highlight reel: A urine soaked Dog kennel, an antique sewing machine, bicycle, elliptical, and a comprehensive family tree which clearly shows Moms side and Dads side shared a Great-great-great grandpa. Whoops. The incestuous family tree: We'll keep that. The sewing machine will go to Chuck's artistic sister and there are fading dreams of fixing up the bicycle. 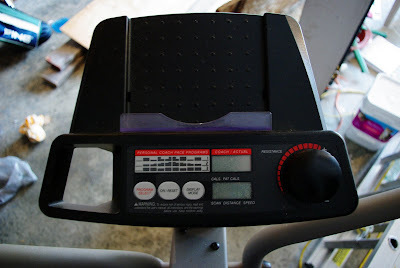 For the elliptical, the hope was that I would actually use it for some sort of exercise and I was 100% on board. Then I remembered that exercising is against my McDonald's religion, so, um, pass. Chuck's spearheading this operation. He posted his ad last night. 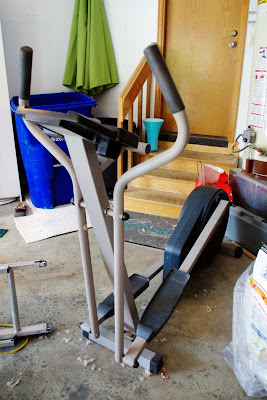 "Pro-Form 545e elliptical machine in very good condition. $50. The 545e is the manifestation of the highest level of ellipticality that mankind has achieved to date. Interesting and/or hilarious trades considered." Only Chuck would consider trades or award humor with an elliptical. Who are we kidding? I so support this, it's not even funny. Leave it to Chuck to find his doppelganger. We got this little gem of an email tonight, our first suggested trade, and we are highly considering the offer because it's awesome. 1. His name is Egbert. 2. This response is better than I ever could have expected. 3. His product is solid, his web site is funnier than the ad, and the question is, what kind of sign would we want? Any help or insight you could give would be great. Chuck thanks you in advance. You def. need to get a sign for your car... not sure what it should say, but I think it's a must!